The Suda On Line (SOL) is a collaborative translation of a Byzantine Greek encyclopedia. It makes this difficult but useful text available to non-specialists and, with annotations and search facilities, makes the Suda easier to use than it is in print. As a collaboration, SOL demonstrates open peer review and the feasibility of a large, but closely focused, humanities project. The Suda On Line (SOL) is a translation of the Byzantine Greek Suda , written and edited by a large international group of scholars and students; its address is http://www.stoa.org/sol/. The Suda is an encyclopedia of classical learning, written in the 10th century AD by a committee of scholars in Byzantium. It is a surprisingly useful source for classicists, but it is not well known to undergraduates or non-specialists because its style is crabbed and difficult. SOL is apparently the first translation of the Suda into English. I will argue that SOL is useful not only as a case study in scholarly collaboration, but as a tool for scholarly work both in classics and beyond. 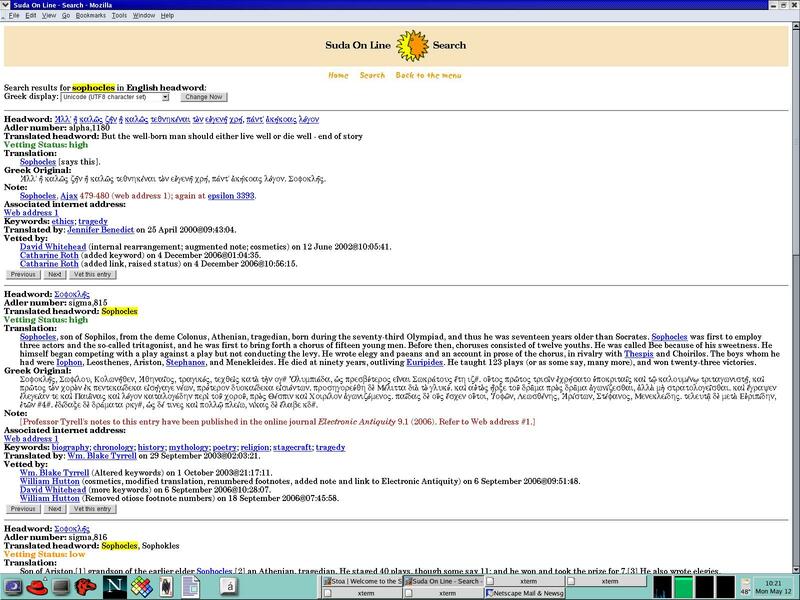 SOL was one of the very first collaborative encyclopedias, pre-dating Wikipedia by several years. Because the Suda itself is an unsystematic collection of lore, not all of it necessarily correct, SOL provides commentary and references for each entry. It therefore serves as a full-scale classical encyclopedia, comparable to The New Pauly or the Oxford Classical Dictionary and roughly between those two works in size. The name “Suda” means “bulwark” or “fortification” — that is, the Byzantine scholars wanted to produce a work that would stave off the destruction of classical knowledge. The work has sometimes been called the “Encyclopedia of Suidas,” as if Suidas were a person, but this is now held to be incorrect. The Suda is organized as an encyclopedia, with entries in rough alphabetical order covering the important people, places, and texts of ancient Greece and the Bible. Its authors had access to some texts that are no longer extant, so there is material in the Suda that cannot be found anywhere else. They also had different editions of some of the texts we still read, so quotations in the Suda may reflect variants that are not preserved in our textual tradition; this makes the Suda important for establishing the correct text of some literary works, particularly Greek drama. Although (as noted above) SOL is apparently the first translation of the Suda into English, it is hardly the first translation out of Greek. That honor goes to Robert Grosseteste, who translated selected entries into Latin in the early thirteenth century. According to [Dionisotti 1990], Grosseteste's project was similar to SOL's: he wanted to make the Suda available and comprehensible to his contemporaries, so he annotated and glossed his translations. Since the Renaissance there have been several more editions of the Greek text, along with Latin translations. Aemilius Portus produced the first complete Latin translation in about 1619. Ludolf Küster produced an edition in 1705, continued by Jonathan Toup. Thomas Gainsford's edition of 1834, also following Küster, was re-issued along with a Latin translation by Gottfried Bernhardy in 1843. Immanuel Bekker's 1854 edition was the standard until the twentieth century. The current standard edition of the Suda was edited by Ada Adler (1878-1946) and published in five volumes between 1928 and 1938. Her numeration of the entries has become the standard reference scheme for the text; one refers to the entry “Abraham,” for example, as “alpha 69.” Scholars continue to look for good ways to work with the Suda . For example, one project which took place just before SOL got started is a database at the Université Cattolica in Milan tabulating all the entries related to Greek and Roman history. Its results are described in [Zecchini 1999]. The SOL project began on 14 January 1998, when Jeffrey Gibson asked on the Classics email list whether there was an English translation of the Suda . In fact, the Suda had never been translated into English, and it was suggested — perhaps tongue-in-cheek at first — that this would be a natural project for a web-based or email-based collaboration. Very quickly people started discussing how such a collaboration might work. 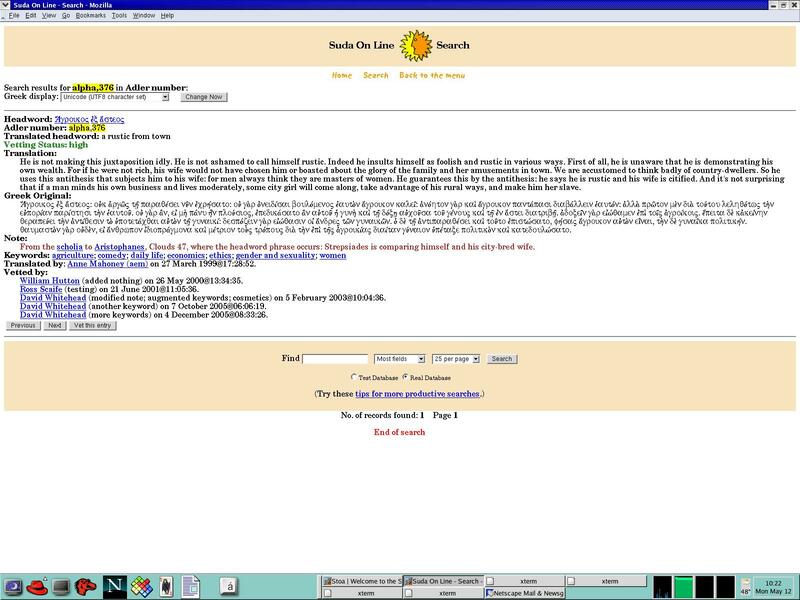 The title “Suda On Line” and the acronym SOL (Latin for “sun”) were suggested by David Meadows. By the 20th, William Hutton had posted a prototype. The next day, it was announced that a computer science graduate student at the University of Kentucky was interested in working on technical aspects of the project as a master's thesis. 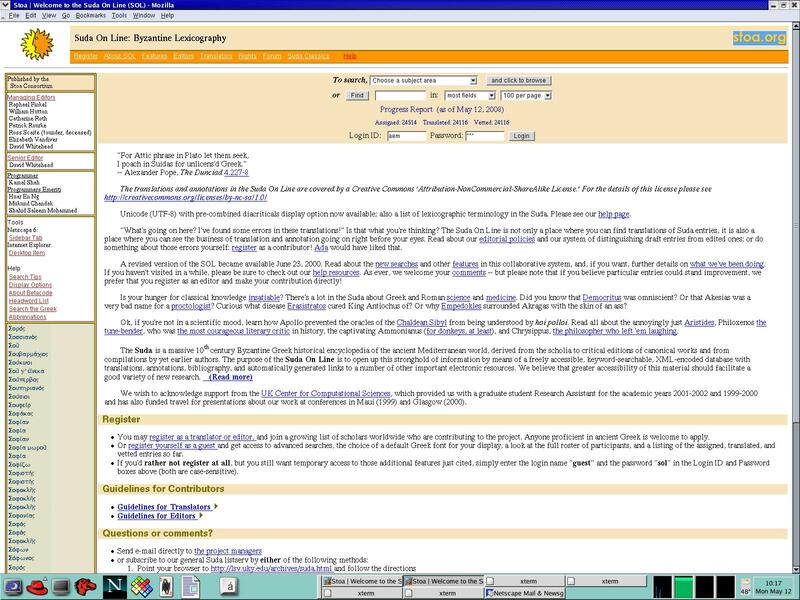 Translation and database design had both started by the end of the month, and the first version of what became the SOL system was announced on 12 April 1998. SOL was implemented as a semi-structured text, in an XML-like markup, though without validation. Wiki technology was not widely known at the time, though as noted above WikiWikiWeb was already on-line; moreover, since Unicode was not yet ubiquitous, display of Greek would have been a problem in a standard Wiki. As a result, the SOL group decided to implement its own system. The translation, commentary, and revision history are stored in a database and converted to HTML on the fly for display. Greek is stored in beta-code and can be displayed in Unicode, transliteration, or any of several popular font encodings, using code graciously supplied by the Perseus Project. The underlying database system is QDDB, a non-relational database developed by Eric H. Herrin II and Raphael Finkel of the University of Kentucky. Code is written in Perl. Virtually all of the programming for the project was done by graduate students Huar En Ng, Mukund Chandak, Shahid Saleem Mohammed, and Kamal Shah. It was agreed very quickly that involving students both as programmers and as translators was desirable, and many students in computer science and classics, both graduate students and undergrads, have made very significant contributions throughout the project. At this writing (June 2007), SOL boasts 7 managing editors, 61 editors, and 95 translators, coming from a dozen countries. Three people — David Whitehead, Catherine Roth, and Jennifer Benedict — have translated over 4,000 entries each; Benedict translated most of hers while she was an undergraduate at the College of William and Mary. Managing editor William Hutton translated over 1000, while seven more people translated 200 or more. At the other end of the scale, some 40 people translated a single entry each. So far, over 21,000 entries have been translated, more than 2/3 of the total. Nearly all of the entries that have been translated have also gone through at least a first round of editorial vetting. Translation and editing are still going on. Collaboration within SOL, as in Wikipedia and other similar projects, takes the form of serial editing. Entries are assigned to translators at their request. Some translators may ask for particular entries on a subject they are working on; others take blocks of unassigned entries in numerical order. Translators then produce English versions, assign key words from a controlled vocabulary, and add initial notes and bibliography. As soon as the translator finishes, the entry is published, clearly marked as a draft. A subset of translators are designated editors and have the authority to change translations. Editors have scholarly qualifications in Ancient Greek; most are college or university faculty members. Their primary task is to augment the bibliography and commentary on the entries. They are also responsible for verifying that the translations are correct. The peculiar style of the Suda occasionally makes this a non-trivial problem. Its Byzantine authors were writing in a dialect somewhere between the classical Greek of the fifth and fourth centuries BC and the native language of the tenth century AD. They occasionally get snarled up in difficult grammar, and frequently use words that cannot be found in standard lexica of classical Greek. As a result, a translator may sail through half a dozen entries with no problem, then run into one that makes almost no sense at all. Editors are assumed to be more expert in Greek than ordinary translators, and often have particular areas of specialization, like history, poetics, or theater. An editor who updates and enhances a translation may change its vetting status from “draft” to “low” (minimally edited) or “high” (well annotated and of high scholarly quality). At present, some 3/4 of translated entries have “low” vetting status. SOL's editorial mechanism, then, is a type of peer review process. The original translator is always credited for the entry, but the editors who have worked on it are also named. When an entry is displayed, its revision history is shown along with it. Previous states of the text are not displayed by the regular display routines, but are available to translators and editors working on the text. SOL's review process is open: the editors know who translated the entry and which other editors have worked on it, and the translator can see who the editors are. In fact, any reader of SOL can see the names of the editors and translators of any entry. This highly transparent process is different from the blind reviewing typical for classics journals: in that system, in general, the author of an article does not know the referees' names, nor do the referees know who the author is. The open review process has been part of SOL all along and no one has objected, or indeed even commented on it. By now the process seems natural, because it is widely used in Wikis and blogs, but as SOL was getting started an open, public peer review system was unusual. What we gain from it is the ability to recognize everyone's participation. Perhaps more important, SOL shows how scholarship progresses. A translation or commentary published in a book appears final and finished; readers are not given any clues about how it came into being. SOL's translations and commentaries show the process of successive refinements, demonstrating that first drafts are almost never perfect, and that even senior scholars' work can benefit from editorial attention. Whenever an editor updates an entry, the SOL system automatically notifies the original translator by email. Translators may then, if they like, return to the entry, inspect the editorial changes, and make further modifications. The project also maintains a mailing list for announcements and general discussion, though it has been rather quiet since the last major software changes. Editing and translating both take place in the same web system, very similar to a Wiki but less elaborate, and imposing somewhat more structure upon the translated entries. Editing screen: A translator or editor updating an entry sees the original Greek and the current version of the entry. Below these is a copy that can be changed. Separate fields are provided for a translation of the headword, the translation of the text of the entry, notes, print bibliography, and web links. A menu facilitates construction of links to certain highly-used resources: Diotima, Perseus, and the Bryn Mawr Classical Review. Finally, keywords can be added from a pull-down list. Within the translation and notes fields, certain HTML-like tags are permitted, including <i> for italics, <t> for titles, and <g> for Greek in beta-code. Other languages — such as Hebrew — are generally encoded in Unicode and not marked. References to other Suda entries by Adler number are automatically recognized and hyperlinked, just as cross-references are made within a Wiki. Search for Sophocles: Results of a search for the name “Sophocles” in headwords. on the famous playwright (sigma 815), his grandson (sigma 816), a later descendant (sigma 817), and an epigram (sigma 820). “Sophocles” appears in the translations of 221 entries and in the notes to 609 (including almost all of those where the name appears in the translation). A separate search mechanism allows searching in the original Greek. As a case study, we may consider the history of Alpha 376, “Agroikos ex asteos,” which means “rustic from town”; see http://​www.stoa.org/​sol-bin/​search.pl?searchstr=alpha,376&field=adlerhw_gr. This entry is fairly typical of the short entries. It was first translated on 27 March 1999; translator Anne Mahoney was a graduate student at the time. Editorial work began in May 2000 when William Hutton first vetted the entry and gave it “low” status. Further work was done by Ross Scaife and David Whitehead, who changed the item's editorial status to “high” in February 2003. Whitehead returned to the item in 2005. Display of Alpha 376: A typical shorter entry. The display shows the translation, the Greek text, and the editorial history. The headword is a phrase from Aristophanes' Clouds , and the text of the entry is taken from the scholia to that play. The main character of the play, Strepsiades, is a country man, but he has married an ambitious woman and they are now living in the city, somewhat above their means. He therefore asks the philosopher Socrates, who happens to be his neighbor, for lessons in clever argument, in hopes of talking his creditors out of calling in his debts. Naturally, it does not work out quite the way Strepsiades expected, and the play ends with an angry Strepsiades setting fire to Socrates' house. The original translation accurately represented the Greek, and noted that the headword appears in Clouds at line 47. The headword was first translated as “rustic man from town”; this became slightly more graceful as “a rustic from town.” In the course of vetting, Whitehead clarified that the Suda took its text from a scholion to the play. The translator originally assigned the keyword “comedy” since the phrase comes from a comic play; the editors added key words “agriculture,” “daily life,” “economics,” “ethics,” “gender and sexuality,” and “women,” based on the content of the entry. At this point, with “high” editorial status, the entry is considered suitable for reference and citation, but it can still be modified again if an editor finds something further to say about it. Another example is Alpha 100, “Abydenon epiphorema,” or “Abydene dessert.” This is an obscure phrase, presented by the Suda as if it were a common proverbial saying. The Suda says that an “Abydene dessert” is something bad that happens as a result of someone showing up at the wrong time, and explains that in Abydos, people used to bring out their children after dinner, to the annoyance of their dinner guests. This all makes sense — the entry is coherent as it stands — but a reader might want to know where Abydos is and where this saying comes from. The SOL translation now provides this information: Abydos is in Asia on the shore of the Hellespont, and the saying ultimately comes from an ancient collection of proverbs, which moreover gives a second, completely different explanation for “Abydene dessert.” As with other entries, this detailed background was added during the course of editing. The initial translation, in August 1998, had no annotations at all. The geographical note was added in January 2001, as was the references to sources for the proverb. The translation was improved as well. Anne Mahoney, Eric Nelson, and David Whitehead worked on this entry, which currently has “low” editorial status. Translating the Suda , by comparison with such undertakings as these, is a relatively small, bounded task. It also requires particular expertise: knowledge of classical Greek. Any reader of English may submit citations to the OED, and anyone may edit entries in projects like Wikipedia. Prospective SOL translators, however, must request authorization and must ask to be assigned specific entries, though virtually everyone who registers is approved. Its model, therefore, is more like that of Citizendium, an offshoot of Wikipedia which adds “gentle editorial oversight” (as it explains on its own home page, http://citizendium.org). Wikipedia and Citizendium are new works, created largely from scratch. Although Wikipedia incorporates articles from earlier public-domain encyclopedias, in particular the eleventh edition of Encyclopaedia Britannica (1911) and the Catholic Encyclopedia (1913), and Citizendium incorporates articles from Wikipedia; in both cases these are a kind of bootstrap mechanism, to get a first version in place as a basis for further editing. Other on-line encyclopedias are digital versions of existing print books. These include commercial resources such as Oxford Reference on-line (http://www.oxfordreference.com) and public-domain resources such as the Catholic Encyclopedia (http://www.newadvent.org/), generally older books whose copyright has expired. Within classics, the Perseus Digital Library (http://www.perseus.tufts.edu) includes the Dictionary of Greek and Roman Antiquities , edited by William Smith and others in 1890; the same author's dictionaries of geography and of mythology; Harper's Dictionary of Classical Antiquities , an abridgment of the Smith works; A Topographical Dictionary of Ancient Rome , by Samuel Ball Platner and Thomas Ashby; and The Princeton Encyclopedia of Classical Sites (PECS) by Richard Stillwell, William L. MacDonald, and Marian Holland McAllister. Of these, all but the last are old enough to be out of copyright; the Princeton University Press gave permission to digitize PECS. Unlike these encyclopedias, SOL is neither a completely new work nor a mere reproduction of an older one. It includes the entire text of the tenth-century original, but the entries are enhanced and expanded with modern scholarship. Of course an annotated Suda does not require the Web, but it would be unwieldy in print. Adler's Greek edition is four fair-sized volumes. The translation alone would naturally be about the same size, and SOL's annotations are considerably larger. On line, however, readers can see entries one at a time, or in groups of search results. Searching and indexing are also considerably easier: it would be difficult, for example, to look through Adler's print edition for the eight entries that use the ancient Greek word for “cat,” or to dig out the entries that give etymologies. The indexes of a print edition facilitate the kinds of searching that the author or editor felt would be useful, and there is a necessary trade-off between providing indexes and the time and space required to produce and print them. Automatically generated indexes, on the other hand, can be replicated nearly infinitely. SOL allows direct access to entries by Adler number, headword, original translator, and editor. It is also possible to search either in specific fields (translation, notes, bibliography) or without restriction, and there is also a search mechanism for the Greek text of all entries, translated or not. As a result, SOL not only provides more information than the plain text of the Suda (in whatever language), it also makes it easier to find and organize that information. SOL's organization reflects that of the original text. Every entry in SOL comes from the Suda ; since the original book had no entry for “Old Comedy,” for example (the particular type of comedy written by Aristophanes and others in fifth-century Athens), there is no general article on this genre in SOL. As a result, absolute beginners in classical studies might find SOL a difficult place to get basic orientation. Once a reader knows some of the basic terms of the field, however, it is straightforward to find the Suda 's quotations from comedy and biographies of the major playwrights. Within those entries, the annotations and references direct the reader to more current work. The audience for SOL, then, is not only the specialist classical scholars who have always used the Suda in the original Greek, but also scholars in other areas (religion, for example), students, and general readers. If SOL is not quite the same as other on-line encyclopedias, it is also not quite the same as other works of classical scholarship. The Suda itself, as an encyclopedia, is a type of commentary on classical texts. Commentaries as a genre are perhaps more familiar to classicists than to scholars in other literary fields, as Most points out [Most 1999]. Writing a commentary is still a prestigious, if nowadays somewhat old-fashioned, project for a classical scholar, and classicists generally read, study, and teach texts with commentaries close at hand. SOL makes the commentary nature of the Suda more explicit by identifying and labelling quotations, providing specific references, and fleshing out the Suda's discussions. SOL is therefore almost the inverse of the “Do-It-Yourself Commentary” envisioned by Willard McCarty as one of the ways the Web empowers scholars [McCarty 2002, 376]. Instead of sending readers out to make whatever links they want, the SOL presents links created by the translators; these may be hyperlinks in the technical sense, or links of the kind long familar to readers of classical commentaries: references to well-known texts by their standard reference schemes. On the other hand, every SOL translator may add links in the course of annotating an entry — not only the expert editors, but anyone who knows enough Greek to take part in the project. Thus the links within SOL are not restricted to the expected references, produced by classicists highly socialized in the discipline's thought patterns, but may include anything at all that a translator finds useful. Some two dozen entries link to Wikipedia, for example; others link to curious sites like the “Table of Nations” at http://​www.mazzaroth.com/​TableOfNations/​TableOfNations2.htm, purporting to list the descendants of Noah (from Epsilon 38, “Hebrews”). Although the range of relevant references may be quite broad, nonetheless annotating a Suda entry for SOL is very much the same kind of work as writing commentary notes for any other classical text: one identifies quotations and allusions, glosses difficult grammar or obscure words, and perhaps mentions similar passages in other works. That is, SOL's editors extend the commentary already implicit within the Suda , giving SOL's readers help both with reading the Suda itself and with reading the texts the Suda discusses. Because SOL is also a translation, it is, in Rydberg-Cox's taxonomy, a project based on “providing access to texts” and “helping readers understand scholarship” [Rydberg-Cox 2006, 22–24]. In translating the Suda , or commenting on translations, contributors are in general not producing new knowledge either about the classical world that is the subject of the Suda or about the Byzantine world that produced it. Boyer has called this kind of work “scholarship of integration” [Boyer 1990, 18], and argues that academic work must go beyond the “scholarship of discovery” [Boyer 1990, 17], which is research in the traditional sense. The importance of SOL is not primarily in helping professional classicists make new discoveries, but in making this material more accessible and more comprehensible to a wider audience. SOL is among other things a form of outreach, a priority of the classics profession (see for example the APA's Outreach Division, http://​www.apaclassics.org/​outreach/​outreach.html). As we have already observed, SOL's translation of the Suda is roughly two-thirds done, and virtually all of the translated entries have been raised from “draft” to “low” status by an initial vetting. The project is quite usable already, though Dickey is correct to point out that readers must pay attention to the amount of editorial attention each entry has received [Dickey 2007, 91]. Based on usage statistics and external links, moreover, SOL is being read. 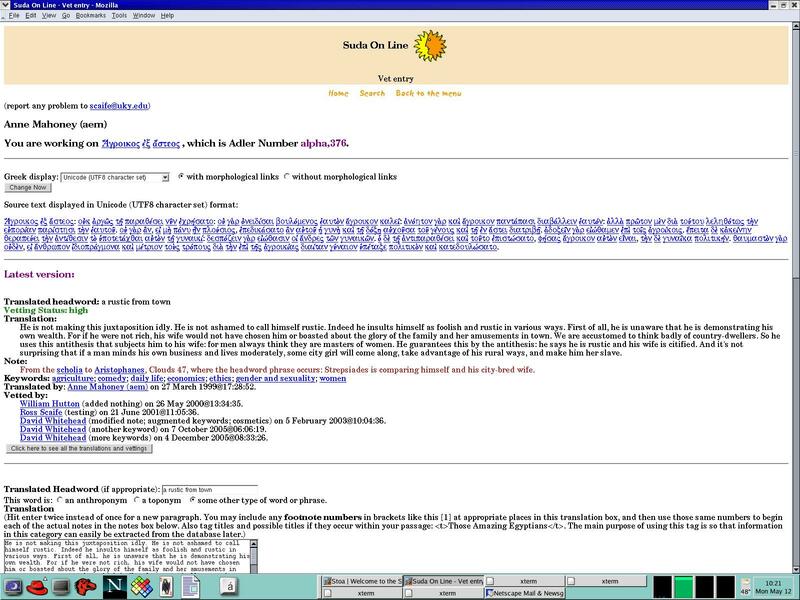 According to the usage statistics page at the Stoa (SOL's home), SOL's search engine has received an average of 7589 hits in each of the last six months, with a range from 9591 in January 2007 to 6226 in April. Various classics portal pages provide links to SOL, notably the UK's Intute (in the Arts and Humanities section, http://​www.intute.ac.uk/​artsandhumanities/), and several blogs have mentioned it, for example http://curculio.org and http://gypsyscholarship.blogspot.com. Not surprisingly, the Wikipedia article on the Suda mentions SOL. Medieval and Byzantine studies sites also link to SOL, for example at Notre Dame, at the Australian Association for Byzantine Studies, at the University of Amsterdam, at the University of Chicago, and even in Google's directory for Medieval and Byzantine studies. As a rule, only classics specialists would use the Suda in Greek, because of its uneven quality and un-classical Greek style. The uneven quality is mitigated by editorial annotations, pointing out where the Suda has confused two similar names or the like. The problem of the gnarled Greek, of course, is solved by the translators. Finally, the problem of figuring out where to look in the Suda for potentially relevant information is solved, at least in part, by the search and index mechanisms. SOL therefore makes this resource available to people who could never have used it before. In less than ten years, then, with minimal funding and largely volunteer labor (the student programmers were paid), this project has gone from a query on an email list to a fairly widely-known resource for the study of the classical world. The technical decisions made by the project were appropriate given available technology in 1998, when implementation began. At that time, most prospective translators did not have access to Unicode, so the project chose beta-code, the established standard encoding for classical Greek. Wikis existed but were not well known. If the project team had been aware of this technology, it could perhaps have adapted a Wiki to manage parallel Greek and English versions of articles, yet it was hardly an irrational decision to write a custom system. Moreover, implementing and maintaining the system was a useful exercise for several students, exposing them to humanities computing and to classical scholarship. The underlying system is not intended to be general; it was written for the Suda and therefore embodies several assumptions about the project, for example that the base text is in Greek, that it is divided into entries identified by “Adler numbers,” and that those entries are generally fairly short. It would be a challenge to retro-fit this code for another project, even one conceptually similar like, for example, translating the Rig Veda from Sanskrit to English. While this means that SOL has not been technologically seminal, it did make the project simpler to implement. The organizational decisions require even less argument. SOL was from the beginning governed by a small team of managing editors, and in 10 years it has added only two people to that group. Because the project requires knowledge of ancient Greek, it was sensible to check prospective translators' qualifications before giving them access to the text. And because the project was intended to be scholarly, it was appropriate to divide contributors into translators and editors, requiring greater expertise from the latter group. What has made SOL successful, however, is its focus. Instead of setting out to produce a complete reference on all of classical antiquity, the project team chose to translate and annotate a single text — a large, complex one, to be sure, but nonetheless a single, bounded text. As a result, there were natural milestones: first hundred entries done, half the entries done, and so on. This helped keep the project moving, as there is always a goal in sight. Moreover, no one faced the problem of figuring out what to say. The entries already existed, so all the contributors had to do was translate them, then explain them. Translating an existing entry, even a long one like Homer (omicron 251) or Jesus (iota 229), seems much easier than writing an essay about the life and works of such a figure. Citizendium has created what might function as a similar focusing mechanism, dividing the topics it wishes to cover into a series of disciplinary groups and listing the articles to be written in each topic, though not every topic's editors have yet created a comprehensive list. (For classics, for example, the “priority articles” to be written are Herodotus, Latin language, Vergil, Ovid, and Cicero — barely a beginning.) Wikipedia, on the other hand, has no set topic list, but accepts entries on everything from classical authors to American professional soccer players. As a result, Wikipedia will never be “finished” in any meaningful sense. It might be possible to have a complete set of articles on classical antiquity within Wikipedia, but the encyclopedia as a whole is deliberately open-ended. The linguistics community has proposed a collaborative project to update the linguistics-related entries in Wikipedia, at least some of which are taken over from Encyclopedia Britannica and have not been updated at all (see http://​www.linguistlist.org/​issues/​18/​18-1831.html for the announcement). Classicists, or other disciplinary groups, could do the same. To begin with, such a project would be bounded in the same way as SOL, because scholars would be working on the entries that are already in Wikipedia. But this project could also have the opposite advantage: scholars would not be constrained to only the existing entries and their structure, but could add or reorganize as appropriate. SOL has shown us that this sort of collaboration can work; as Suda translation comes to a close, perhaps translators looking for another project could follow the linguists' lead. As a tool for scholarly work, SOL makes the Suda accessible as it has not been before. SOL makes the Greek text available to those who can read it and supplies an English translation for those who cannot. Its searching and indexing make the Suda easier to use than it is in print form. The commentaries both within the Suda itself and added by the SOL translators bring the somewhat random 10th-century encyclopedia up to date. As a collaboration SOL demonstrates the feasibility of open peer review and the value of incremental progress. I was involved with SOL from the very beginning, and it was through this project that I first met Ross. I then served as programmer and co-editor for the Stoa for several years, a position in which I could see first-hand his energy, vision, and breadth of knowledge. With Diotima, SOL, and the Stoa, Ross did a great deal for classics; these projects are a succesful combination of popularization, accessibility, and scholarship. Although Wikipedia is perhaps the best known Wiki-format collaborative encylopedia, WikiWikiWeb came first, as early as 1995. See http://c2.com/cgi/wiki?WikiHistory for its history. Wikipedia itself was created in 2001, according to its own history, at http://en.wikipedia.org/wiki/Wikipedia:About. The name “wiki” is taken from a Hawai'ian word meaning “quick” which I have Hellenized for the title of the present article. The reduplicated form “wikiwiki” is a frequentative or intensive. As L. D. Reynolds and Nigel Wilson put it, “despite a certain amount of dubious or erroneous material [the Suda ] transmits much useful information” [Reynolds 1991, 66]; they go on to suggest that “the intelligence of the authors cannot be rated very highly,” which seems a bit harsh. For more on the history of the Suda and its importance to classical scholarship, see [Dickey 2007, 90–91]. The Classics email list was at that time hosted at the University of Washington; it has since moved to the University of Kentucky. The official home page of the list is http://lsv.uky.edu/archives/classics-l.html. [Finkel 2000] is an overview of the design and implementation of the project, written by the original managing editors. Beta-code is a plain ASCII encoding for polytonic Greek developed by the Thesaurus Linguae Graecae (TLG) long before Unicode was available, and widely used in classics. It is documented at http://www.tlg.uci.edu/BetaCode.html. QDDB is available from Herrin Software Development; documentation and downloads are at http://www.hsdi.com/qddb/. [Herrin 1996] is a technical description. The Greek text of Adler's edition was provided to SOL by courtesy of the TLG. This is at least the ending of the version we have; the play was revised when its first performance was unsuccessful. See [Henderson 1998] for the text of the play, in Greek and English, and MacDowell for background [MacDowell 1995, 113–150]. Details of the OED Readers Program are at http://dictionary.oed.com/readers/research.html; for the history of the dictionary, see [Winchester 2003]. [Damrosch 2006, 16], referring to a period around 1860. SOL also makes the Suda available to classicists who do not have access to Adler's edition. Large universities with doctoral programs in classics will certainly have these volumes in their libraries, but smaller colleges or high schools probably will not. In addition to Most, see the articles in [Shuttleworth-Kraus 2002] on commentaries as a genre. To be precise, the statistics page http://www.stoa.org/stats/ reports 6440 hits on SOL's search program in June 2007, 7128 in May, 6226 in April, 8550 in March, 7597 in February, and 9591 in January. It does not report hits for the editing and vetting routine or for SOL's home page, nor does it distinguish between hits from actual users and those from indexing crawlers. Adler, Ada, ed. Suidae Lexicon. Lepizig: Teubner, 1928-1938. Boyer, Ernest L. Scholarship Reconsidered: Priorities of the Professoriate. New York: Carnegie Foundation for the Advancement of Teaching, 1990. Cancick, Hubert, and Helmut Schneider, eds. Brill's New Pauly: Encyclopedia of the Ancient World. Leiden and Boston: Brill, 2002. Damrosch, David. The Buried Book: The Loss and Rediscovery of the Great Epic of Gilgamesh. New York: Henry Holt and Company, 2006. Dickey, Eleanor. Ancient Greek Scholarship: A Guide to Finding, Reading, and Understanding Scholia, Commentaries, Lexica, and Grammatical Treatises, from Their Beginnings to the Byzantine Period. Oxford: Oxford University Press, 2007. Dionisotti, Arthur C. “Robert Grosseteste and the Greek Encylopaedia”. In Marta Fattori, Rencontres de Cultures dans la Philosophie Médiévale. Edited by Jacqueline Harnesse. Louvain-la-Neuve: Publications de l'Institut d'études médiévales, 1990. pp. 337-353. Finkel, Raphael, William Hutton, Patrick Rourke, Ross Scaife and Elizabeth Vandiver. “The Suda On Line”. Syllecta Classica 11 (2000), pp. 178-190. HendersonJeffrey. Aristophanes: Clouds, Wasps, Peace. Loeb Classical Library. Cambridge: Harvard University Press, 1998. Herrin, Eric H., and Raphael Finkel. “Schema and Tuple Trees: An Intuitive Structure for Representing Relational Data”. Computing Systems 9: 2 (1996), pp. 93-118. Hornblower, S., and A. Spawforth. Oxford Classical Dictionary. Oxford: Oxford University Press, 1996. MacDowell, Douglas M. Aristophanes and Athens: An Introduction to the Plays. Oxford: Oxford University Press, 1995. McCarty, Willard. “A Network with a Thousand Entrances: Commentary in an Electronic Age?”. In Roy K. Gibson and Christina Shuttleworth Kraus, eds., The Classical Commentary: Histories, Practices, Theory. Leiden and Boston: Brill, 2002. pp. 359-402. Most, Glenn W., ed. Commentaries = Kommentare. Göttingen: Vanhoeck and Ruprecht, 1999. Pfeiffer, Rudolf. History of Classical Scholarship: 1300-1850. Oxford: Oxford University Press, 1999. Reynolds, Leighton D., and Nigel G. Wilson. Scribes and Scholars: A Guide to the Transmission of Greek and Latin Literature. Oxford: Clarendon Press, 1991. Rydberg-Cox, Jeffrey A. Digital Libraries and the Challenges of Digital Humanities. Oxford: Chandos Publishing, 2006. Shuttleworth Kraus, Christina. The Classical Commentary: Histories, Practices, Theory. Edited by Roy K. Gibson. Leiden and Boston: Brill, 2002. Winchester, Simon. The Meaning of Everything: The Story of the Oxford English Dictionary. Oxford: Oxford University Press, 2003. Zecchini, Giuseppe, ed. Il lessico Suda e la memoria del passato a Bisanzio: Atti della giornata de studio. Bari: Edipublia, 1999.